Auth Hobo International Brown Leather Zoe Wristlet Clutch NWT! lindas_clothing_shoes has no other items for sale. 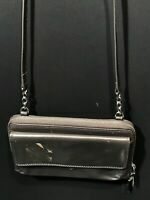 Details about HOBO INTERNATIONAL Cream Leather Zoe Zip Wristlet Clutch Purse NICE! !